First thing: I wonder if I am using this tag wrong. The Social Network was clearly not a documentary, but “drama” by itself implies fiction. Is there a classification for modern drama based on true events? ….that can fit into the tag of “$adjective drama”, I mean. Anyway, though, I understand all the critical buzz this movie got last year. The script by Sorkin wasn’t as non-stop poppy as some of his previous efforts, but since the subject matter was less breezy than The American President and less smug than A Few Good Men, it definitely worked being a little heavier. And the acting, well, I can’t say for sure whether Jesse Eisenberg is kind of brilliant, but it doesn’t seem like it would be easy to make me dislike you and feel bad for you at the same time, no matter how good of a script you were handed. Anyway, though, not a lot to say about the plot of the movie, but if you were ever interested in the genesis of Facebook, this is where’d you’d go. And if you were not interested, it’s a good enough movie on its own merits that unless you are a shut-in who hates the internet and everything it stands for (like my great-uncle! ), you’d probably like it anyway. It has so many good things, like genuine moral dilemmas, smart plot parallels, people who maybe actually learn from their mistakes, and like I already said, a lot of good acting. Well, I didn’t say that, but don’t let my singling-out of Eisenberg be seen to cast aspersions on anyone else. Good stuff, yo. This entry was posted in Film and tagged docudrama on July 31, 2011 by Chris. I’ve played a lot of games this summer, you guys! And I’m seemingly not done yet, so, pretty cool. Anyway, this is a sequel to a game from back before the console revolution, F.E.A.R. The second entry, Project Origin covers the immediate aftermath of original game, from a new perspective and with some small degree of overlap. Basically, where the first game explored the mystery of how the creepy little girl was involved with Paxton Fettel and his army of psychically-controlled Replicant soldiers, the second game goes deeper into both the future and the past of the corporation that caused all of this to be as well as into the story of Alma herself, creepier than ever but no longer quite so little. Of course, not much of the game by percentage follows that story, and what is revealed is on the whole unsatisfying by itself: this game has “middle of a trilogy” written all over it. And honestly I don’t think the enemy AI was as challenging as last time, though whether that says more about the game or me is impossible to determine. Luckily, it was still eminently playable and full of moody scares, which is really the number one reason I was here in the first place. At least as scary as I remember the first one being? So between that and the speed with which I breezed through it, I regret nothing and in fact still want to play the third (and final?) game in the series. This entry was posted in Software and tagged FPS, Japanese horror, XBox 360 on July 26, 2011 by Chris. Because, Bridesmaids, right? And I know, I know, how do two datapoints make for a good year? By comparing to the past, yo. This entry was posted in Film and tagged black comedy on July 26, 2011 by Chris. Geeze, this took too long. Do you know that by the time I opened the new book I’ve been pushing towards all this time while not reading anything else at all (I even stopped the comics at the end of 1975, this is serious business is all I’m saying), it had been out for a full week? All the discussions are nearly finished! But at least I’m in it now, so that’s pretty cool. Back to the topic at hand, I should note that I remembered almost nothing of this book except that I hadn’t liked it all that well. It wasn’t bad, but it was disappointing for the gap, and that had loomed larger in my mind over the intervening years awaiting another new one. There’s a lesson in that, and the lesson is this: don’t read long doorstop series until they are completed! I know people say that a lot anyway, but my reasoning is potentially different? At the least, I’m definitely not talking about the fact that the author may suddenly die and you don’t get to find out what happened. It’s more that I have found that books I disliked in the middle of a series read a lot better when there’s no pressure on them to be “oh thank god, the new book”. This isn’t a panacaea by any means, but it’s happened often enough for me to take the hint. I mean, no, I won’t change my habits, but I’ll at least have a better idea of what just happened. The point is this: the parts that bored me were less bring than before, the parts that I liked okay were almost universally really good. But what was A Feast for Crows about, you ask? Memory, I think. Nearly every character in every arc spent some huge portion of their time considering the past and its influence on the present, to a really strong degree. Much moreso than in any other book (excepting Ned’s memories of Robert’s Rebellion and his intertwined personal stakes in the first book, which, well, I suppose there were good reasons to not save that part ’til this volume). Pity it wasn’t a feast for ravens, lest I should have been able to make a pretty cool Norse reference here. And, that’s all I got. That review, I should warn you, is shockingly spoiler-laden if you have not read the rest of the series up to it. This entry was posted in Words and tagged A Song of Ice and Fire, epic fantasy on July 21, 2011 by Chris. I’m always so happy when I finish a game! Though in this case, it was long enough that I may need to take a break (or at least a palate cleanser) before I start anything else serious. So, remember when I hated Assassin’s Creed? 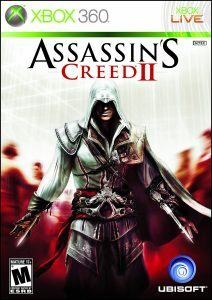 But I thought I would still love Assassin’s Creed II after a brief glance at it? So, yeah, that turned out to be true. It is the same as the other game in most important respects, only subtly better every time there’s a comparison to be made. Giant sandbox of a game, this time set in 15th Century Italy, where assassins must battle Templars for control of the hearts and minds of people, and, well, also the future. But that’s okay, because the future is in every bit as much evidence as the past; in fact, you’re not really in the past so much as your near-future guy is going into a cool machine that lets him live the memories of his ancestors (I think?) and learn from them, both skills and information. So while the game is open and sandboxy and actiony and jaw-droppingly beautiful, the plot is science-fictional and always interesting. Plus also, if you for some reason don’t care for the high-level plot, the plot on the street is of this kid first learning about his family’s secrets and then, when things take a wrong turn, setting about fixing everything, over 25 years of life. Good drama! And if none of that does it for you, you also get to climb really tall buildings, wander around dusty tombs, and sometimes pounce on people from 40 feet above to stab them in the throat. And hang out with Leonardo da Vinci all the time. And learn a lot about regional history. And… y’know, if you’re not persuaded by now, I really don’t know what I could add. Damn fine game, though, and I feel bad for you. I quickly decided the easiest thing to do would be to assume everything that happens in the past portion of the game is historically accurate. I’m pretty sure it was, anyway, so. This entry was posted in Software and tagged historical fiction, sandbox, science fiction, XBox 360 on July 21, 2011 by Chris. It’s just that, when comparing it with the tight-focused character drama of Part 1, it’s impossible not to notice that what could have been an admittedly far-too-long movie that had just about everything any movie could need is instead two movies, one that interleaves magic and mystery with some of the best ensemble teen acting I’ve seen, and the other that interleaves magic and mystery with, y’know, loud summer explosions. I feel bad, because this makes the second movie sound worse as a standalone than it really is and also because it oversimplifies the situation and leaves some things out. But it’s still fundamentally true. Sorry it’s probably too late when you see this to get a double feature, as that’s clearly the way to go. It doesn’t matter that they were possibly early 20s by then, dammit. This entry was posted in Film and tagged fantasy on July 18, 2011 by Chris. Last time, I said this book maybe didn’t have much of a theme. I’m not sure if that’s true, though it still seems possible. I certainly noticed a lot of music, where there was not so much of any in the previous books, and not any in the next one too, at least to my entirely faulty memory. (On the bright side, it won’t be terribly long until I correct that impression, if needed.) That said, I can’t really attach anything to the fact of this being the most musical book in the series. Well, that’s not entirely true, as there is certainly an air of fiddling while Rome burns to the whole affair. And that’s the truth of the matter, because there cannot possibly be another book in the series that so casually disposes of so many resources, lest Westeros be well and truly emptied before the Others (the Other? I’m starting to wonder just how accurate Melisandre might be about all this; it’s not like being a terrible person stopped anyone else from winning in this series) make their way into full-blown war against the world of life. I can’t think of anything to add that wouldn’t be a massive spoiler, but I still cannot get over just how very much I ended up liking… well, probably you know exactly who I mean if you’ve read it, and if not, ask me and I’ll answer. This entry was posted in Words and tagged A Song of Ice and Fire, epic fantasy on July 11, 2011 by Chris. This entry was posted in Film and tagged documentary on July 11, 2011 by Chris. Giant robots? Explosions? Random people yelling “Optimus!” at regular intervals? Yep, it’s a valid live-action Transformers movie. I don’t want to say a lot about it, partly because we both know there’s not a lot to say, and partly because it doesn’t seem right to accidentally give away what threadbare moments of plot exist. But I was definitely impressed by the extent as well as the quality of the extended cast, I dug the new girlfriend (though I wish she’d had more to do besides look pretty and be in danger, but, y’know, Michael Bay), and I was pleasantly surprised by the lack of racist, moronic robots as “comedy relief”. I can’t decide if it’s worth mentioning that the plot had a massive, glaring flaw or not. (‘Cause, again, Michael Bay. Right?) And despite how (glaring plot flaw aside) it was a largely good popcorn flick, I still don’t think I’ll ever get over the first impression I had, when I was watching an incredible sci-fi movie preview about how the moon landing was a cover-up for our exploration of a crashed alien spacecraft, and I really wanted to see what would happen next. And then what happened next was Transformers 3 instead of something new, gorgeous, and possibly amazing. Dark of the Moon was funny, cool, and chock full of exploding robots, and, okay, it was gorgeous; but it was by no means amazing, much less new. This entry was posted in Film and tagged 3D, action on July 9, 2011 by Chris. Priest was an odd duck of a movie, because it didn’t really try to be anything. There’s this weird alternate reality, see, where humans and vampires have been openly at war for centuries, and despite that the vampires are far stronger and vastly numerous, somehow the sunlight advantage has allowed humans to progress scientifically and spiritually throughout the years, culminating in some kind of religio-genetic hybrid warriors with cross tattoos on their faces who took the war back to the vampires and pretty much won it. Only now, maybe the war isn’t really over after all, and the church leadership is in denial and considers anyone who wants to investigate the opposing viewpoint to be anathema. So there’s you a great little theme about corrupt religious power, versus reason, versus true faith, probably versus other possibilities as well, only, yeah, once the premise was settled, they went nowhere with it beyond cartoonish antagonism. And there’s a thick, rich Vietnam metaphor in the priests, who everyone can recognize as having been part of this great war that was a stalemate at best, and they no longer have any place in society now that what they were created for is over, and one of them is beset on all sides, by the law, by his past, by threats to his family, and this is the most Rambo-like character I’ve ever seen, only…. again, they did nothing with him. He almost had a sympathetic superior, but not really. He kind of had people to go rescue to prove the war hadn’t ended, but the scope was too narrow. So, instead of all this potentially rich territory, there was a lot of CGI kung fu, cool explosions, and implausible usage of motorcycles. Oh, and a giant pile of sequel-bait, except all the possibilities for conflict more compelling than “we’d better kill this next dozen vampires” was already ignored and discarded here in what I hope will not be described by future generations as the first movie. This entry was posted in Film and tagged action, horror on July 9, 2011 by Chris.